Happy (belated) Teacher’s Day! China has a special holiday to honor its teachers, and they go all out to celebrate. The flower stands sell oversized bouquets and fruit baskets that students present to their teachers. The Yunnan University student group delivered single roses and throat lozenges (!!) to all teachers before their first classes. I ended up getting an extra rose as a photo op! Students wrote me notes and sent me numerous text messages throughout the day. 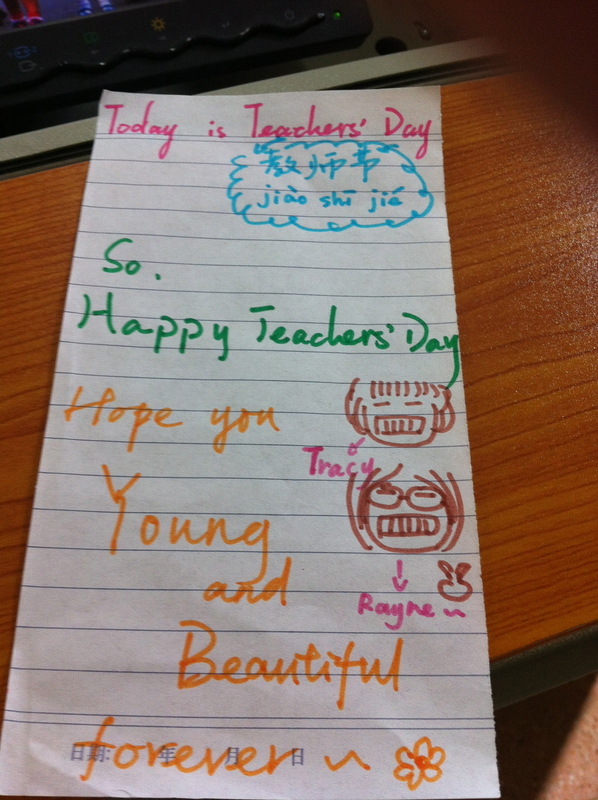 It was nice to feel loved, with wishes such as, “happy teacher’s day! i wish you more beautiful *^o^*” I even used two of the lozenges in the afternoon. In the afternoon, I stumbled upon a few bright pink posters near the dining hall on campus. 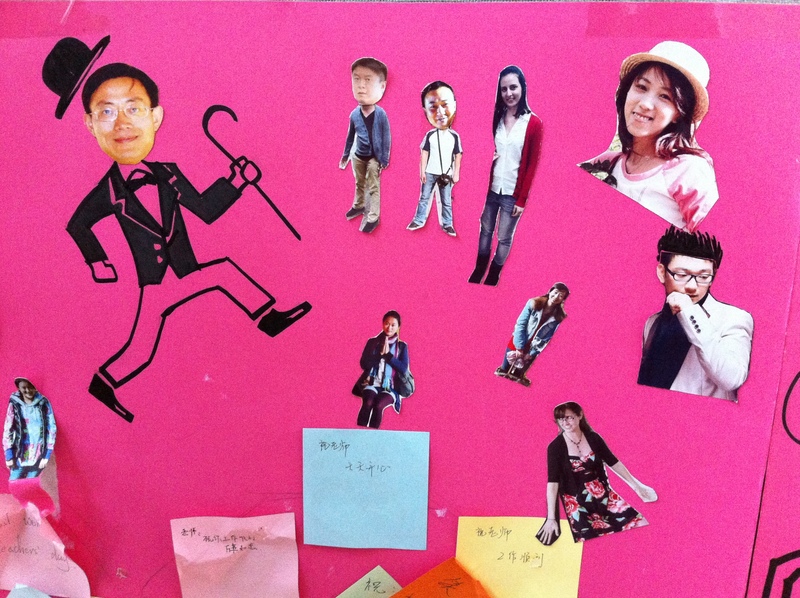 They had poems and nice things written about teachers (all in Chinese), but what caught my eye was a few pictures of people I know! 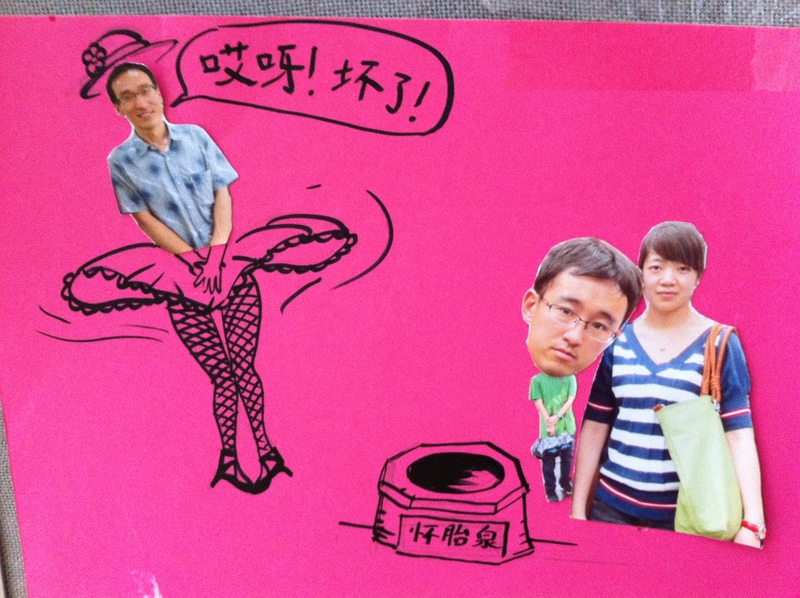 It turns out that the posters were made by our students, and I made a special appearance in one of the collages. Where’s Kim? The teacher on the left is one of the Chinese English teachers in the department. I share an office with him and he’s an amazingly kind and dedicated teacher. I’m taller than the two men next to me… and Jess (roommate and coworker last year) is in the flowery dress at the bottom. I’m glad they didn’t do anything crazy to my picture! I really do feel lucky to have such a great bunch of students, because they are the reason that I enjoy my job so much. The freshmen finishing their month of mandatory military training in a week, and I’m anxious to get to know them too. Also, on a sad note, I wanted to let you know about the magnitude 5.7 earthquake that shook part of Yunnan Province on September 7. I was in Kunming, and didn’t feel anything, but found out about it on the news. Eighty deaths have been reported, and recent rescue efforts have been hampered by the area’s mountainous terrain and heavy rain. Please keep the people of Yiliang County in your thoughts. Lozenges??? How sweet! Sounds like a great reason to celebrate. Love to you from Mendon.